With fall upon us seasonal affective disorder (also called SAD) is now in its beginning stage, SAD is a kind of seasonal depression that is most prevalent in the winter because of the decreased amount of natural sunlight. This type of depression is most commonly known as the winter blues and begins early fall until spring. A less common type of SAD, known as summer depression, begins in the late spring or early summer. Common signs of seasonal affective disorder include what some sufferers collectively describe as a desire to hibernate; fatigue, lack of energy, increased desire or need to sleep and lack of interest in activities. Other symptoms include: withdrawal from social interaction, overeating and weight gain, with stronger cravings for carbohydrates. This last symptom supports the serotonin-deficiency theory because carbohydrates facilitate serotonin production. In more severe cases, sufferers may also be highly emotionally sensitive and have feelings of unshakable sadness and hopelessness. The intensity of their symptoms can start to interfere with their relationships and normal everyday functioning. Symptoms resemble other types of depression, what distinguishes them is their timing and seasonally cyclical onset. Light Box Therapy has become one of the most popular and revolutionary ways to treat seasonal affective disorder. This revolutionary LEDlight therapy treatment has proven to be an effective method to eliminating SAD, the winter blues, postpartum, empty nest and so much more. There are many benefits to using a LED light therapy box such as being able to perform this treatment in the comfort and privacy of your home, affordability and convenience. 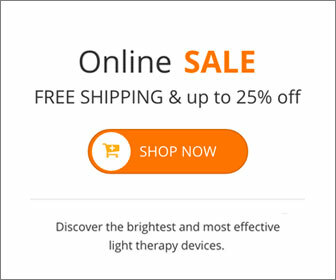 LED light therapy is a proven method of treating seasonal affective disorder and has become a popular alternative to prescription medication. Generally, light box therapy treatment takes about 30 minutes a day and is best used in the morning. This entry was posted on Thursday, October 10th, 2013 at 11:31 am	and is filed under Light Therapy. You can follow any responses to this entry through the RSS 2.0 feed.